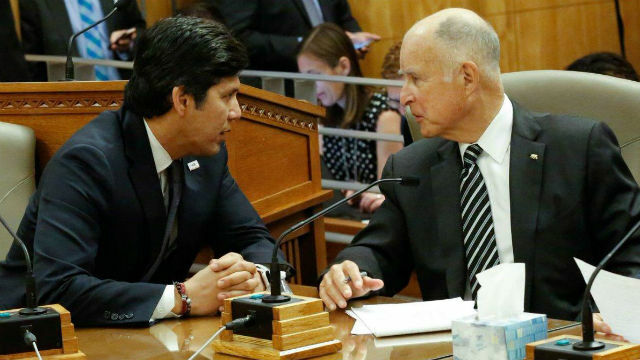 California’s innovative “cap-and-trade” system to control greenhouse gas emissions and slow climate change was extended to 2030 Monday in close, bipartisan votes in the Legislature. Senators voted 28-12 to extend the program through 2030, with all Democrats and one Republican — Sen. Tom Berryhill from Modesto — voting in favor. The Assembly then voted 55 to 21, with seven Republicans joining their Democratic colleagues. Cap and trade is a market approach to pollution control. The “cap” part limits emissions and the “trade” part allows companies to buy and sell allowances. The extension was the subject of an intense, week-long lobbying push by Gov. Jerry Brown, who has raised California’s environmental profile in the wake of President Trump’s decision to exit the Paris agreement. Even though cap and trade is a free-market approach, Republicans argued it was too expensive for companies and that in any case California can’t do much alone to stop global warming. Some environmentalists said it didn’t go far enough. However, the measure received last-minute support from two GOP luminaries. Former Gov. Pete Wilson and former U.S. Secretary of State George P. Shultz issued letters Monday backing the proposal. Among the Republicans voting to extend the program was Rocky Chavez from Oceanside, who argued that alternatives to cap and trade were “far costlier” and Republicans had secured other victories in the process.